The Rosewarne New Year’s Honours … A New Goodchicken! With the sad losses of both Lavender Goodchicken and Greta Goodchicken this year, our garden was left without a special Goodchicken girl. Only the very kindest, sweetest girls can be awarded the Goodchicken title; hens who have never thrown a peck in anger and who have always put their sisters’ well-being before their own. They are inspired by the original Goodchicken – Bunty. A hen whose goodness, kindness and beauty are much revered in Rosewarne legend. Lemony was the standout choice to become a Goodchicken – in fact the award is long overdue. She performed services of love, care and attention, far, far above and beyond, when she cared for the elderly Effie. Not only did she have to give up on the opportunity of joining the Big Girls but she missed being with her two sisters who had already joined the main flock. But Lemony stayed with her beloved Effie; caring for her, preening the tail that Effie’s neck wouldn’t let her preen herself, keeping her company, tucking up with her at night and sharing Effie’s favourite pastime of coming inside to watch the washing machine go round. 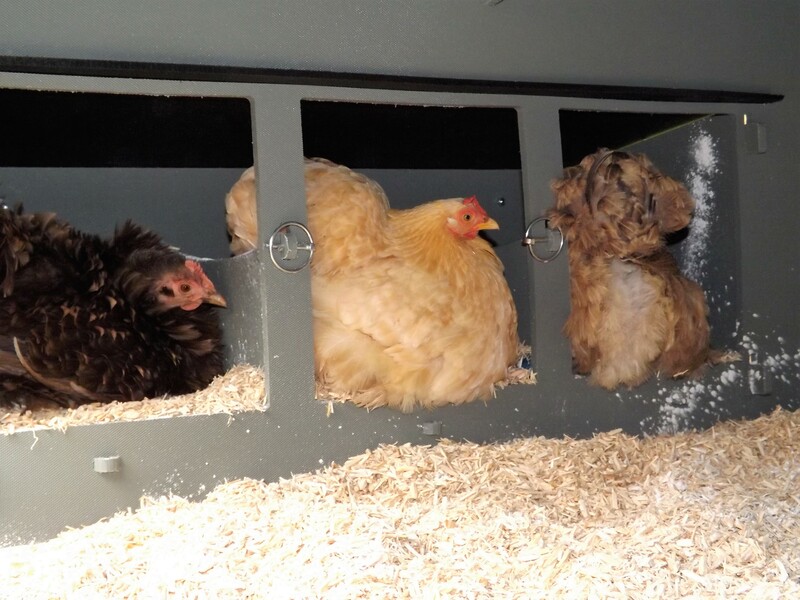 Even as Effie’s health was failing and she came inside on a more permanent basis, Lemony stood on duty outside the Human Coop, waiting for a brief moment with her elderly friend. 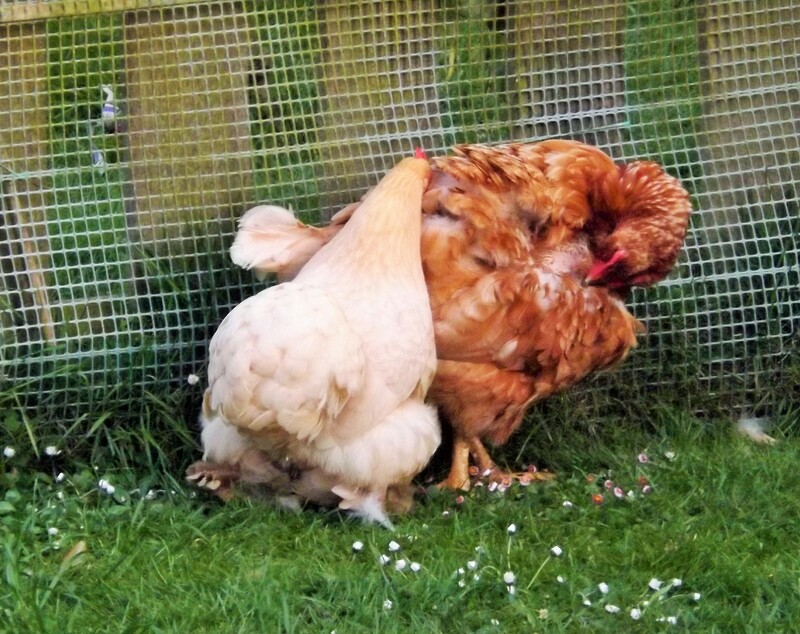 That moment came in one last dustbath together, where Lemony preened Effie and they said their goodbyes. 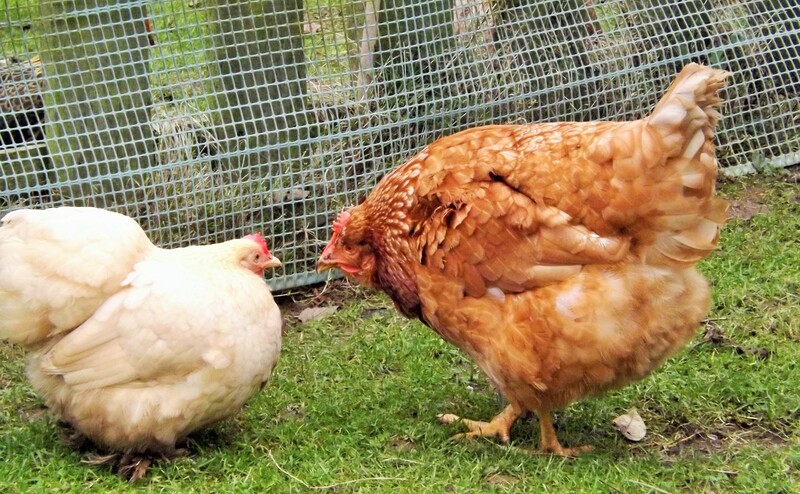 As Effie came back inside the Human Coop for the last time, so Iona bantam, who had been watching events unfold, came over the fence and escorted Lemony into the Big Girls’ Garden. Lemony settled in very well, Iona and Inca ensuring that no one picked on her. But the Rosewarne ladies had watched Lemony caring for Effie and knew that she was a very special girl and would never dream of picking on her. In fact, Flora-Jayne decided that she loved Lemony very much – just a bit too much – and it is for enduing Flora’s amorous attentions that makes Lemony even more of a special girl. Lemony loves Flora, you see; I think it is because Flora is a big, brown chicken and in Lemony’s mind, a big brown, Effie-shaped chicken means love and friendship. Only Flora’s hormones cause them no end of problems!! 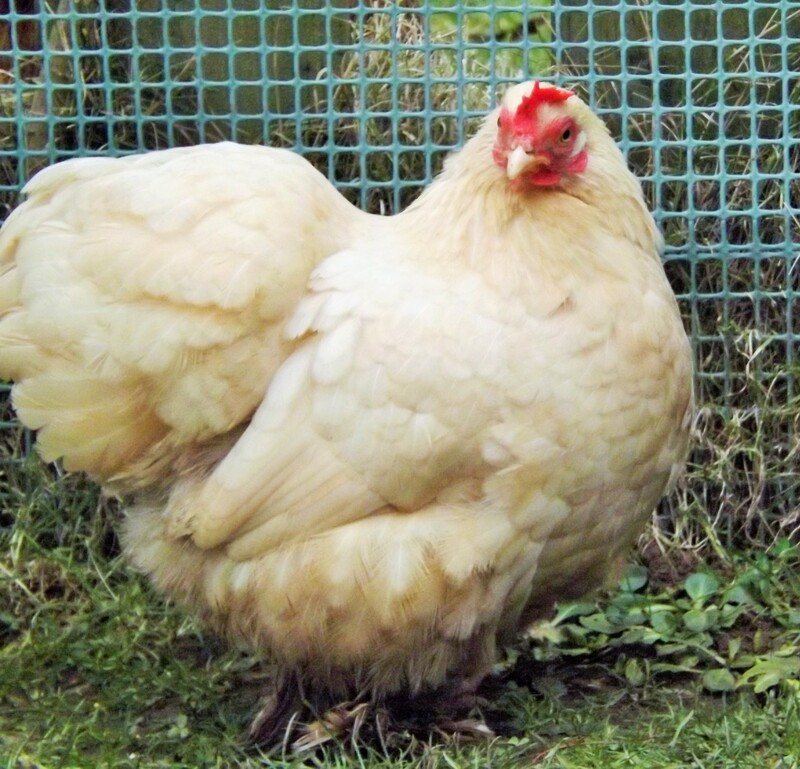 But Lemony is now and always will be a Goodchicken, a fluffy pale yellow ball of beauty and love scuttling across the garden, tiptoing over the wet grass and generally bringing a little sunshine into our world. We love her so much and she is a very well-deserved recipient of this precious title. A well deserved award of the Goodchicken title, given to a lovely lady where it will be worn with honour.